After that late penalty last week against Southampton, the one we actually did get, we go back on the road tomorrow, down to Brighton with the game kicking off at 5:30 p.m. Thanks very much BT Sport. You have cocked up the next away game for some Burnley fans by moving it forward 24 hours at too short a notice and as for this one, words fail me, arranging our game at a time when it is very difficult for our supporters to actually get home. The one plus with the kick off time is not having to get up at some unearthly hour although it has forced us to change our plans. I know television rule the roost now but there really has to be some consideration for travelling supporters and by that, not just keeping tickets at £30. The last three away games have been more similar to last season than what we’d witnessed for most of the first half of this season. We’ve won one and drawn two of the most recent games and it could so easily have been three wins if the assistant referees had actually got their decisions correct. But, that will all count for nothing tomorrow when we will have to turn in a very good and disciplined performance if we are to come away from the Amex with anything. Brighton are an uncompromising side and difficult to play against but if we can continue playing the way we are, we have every chance of coming home with some points. We still need those points. Had decisions gone our way, no, if decisions had been correct in the last three games then there could have been some distance between us and the bottom three. That’s not been the case unfortunately and so we go into tomorrow with just a two point lead over Cardiff. We could actually be back in the bottom three by kick off should Cardiff beat Southampton tomorrow afternoon. Westwood has started 19 of our Premier League games this season and that’s already more than he played last season when, until the end of January, he had to sit behind ever presents Jack Cork and Steven Defour. However, Defour’s injury has given him more opportunities and he’s currently in the best form he’s shown since signing from Aston Villa two years ago. With Defour still ruled out, Westwood is certain to start tomorrow alongside Cork in the midfield and it could be the same team that drew with Southampton. Both Jόhann Berg Guðmundsson and Robbie Brady returned via the bench last week. The return of both is an option but I suspect they will again be on the bench. Matt Lowton’s toe is improving and he’s back on the grass, Defour is getting closer while Kevin Long currently has an injury. That just leaves Aaron Lennon who is current recovering from knee surgery. I suspect our team will be: Tom Heaton, Phil Bardsley, James Tarkowski, Ben Mee, Charlie Taylor, Jeff Hendrick, Ashley Westwood, Jack Cork, Dwight McNeil, Ashley Barnes, Chris Wood. Subs: Joe Hart, Ben Gibson, Stephen Ward, Jόhann Berg Guðmundsson, Robbie Brady, Matěj Vydra, Peter Crouch. Brighton’s first ever Premier League season ended with a 15th place finish on 40 points. This season is every bit as good with 27 points from 25 games but they’ve slipped recently with only one win in their last ten games. It’s left them just three points ahead of us so a Burnley win tomorrow would see us go behind them on goal difference. They are currently top of the group you would think have relegation concerns. The two teams directly above them, Leicester and West Ham, both have 32 points and it is unlikely they would get dragged in with just thirteen games remaining. The main goal threat will, as ever, be Glenn Murray (pictured). He’s hit double figures already this season, albeit with three penalties. Apart from Murray, only central defender Shane Duffy, with four, has more than two goals. Murray came on as a substitute in the FA Cup replay against West Brom two nights ago to win it with two goals after former Burnley target Florin Andone equalised. Andone won’t play tomorrow. The television cameras picked up an elbow for which he has received a three match ban, starting tomorrow. Chris Hughton made numerous changes for the cup tie and is expected to go back to a team similar to the one that drew with Watford last week. That team was: Mat Ryan, Martín Montoya, Shane Duffy, Lewis Dunk, Gaëtan Bong, Davy Pröpper, Yves Bissouma, Solly March, Pascal Groß, Jürgen Locadia, Glenn Murray. Subs: David Button, Leon Balogun, Dan Burn, Anthony Knockaert, Beram Kayal, Alireza Jahnabakhsh, Florin Andone. Just a few days before our trip to Brighton last season we’d beaten Stoke 1-0 at home to go fourth in the Premier League and leave our manager Sean Dyche as the proudest man in Proudsville. It was an incredible time, less than two weeks before Christmas and there we were in a Champions League position, even if it was for just a short time. It wasn’t a classic at the Amex, but it was another game on the road when we came home with something, a point from a well earned 0-0 draw which meant only two of the nine away games had been lost, something we’d never experienced before in this league. Embed from Getty ImagesWe were second best in the first half when Brighton came closest to taking the lead from the penalty spot. James Tarkowski was adjudged to have brought down Glenn Murray. He hadn’t. It was a shocking decision but Murray blazed it high over the bar. Chris Hughton, who bizarrely is more Mark Hughes like than Mark Hughes after games, actually thought it was a correct call from the referee. He also thought they should have had a second penalty when the ball was actually out of play awaiting a throw in. Interestingly, referee Chris Kavanagh opted to take no action when Tarkowski’s arm later made contact with Murray who was pulling at his injured hand. Our player later received a ban from the FA. It all changed in the second half. They cleared one effort off the line, we had a goal disallowed that for offside, a decision that looked very, very tight, shall we say and then Wood missed the best chance of the match for us. In the end, a 0-0 draw, and another good point. 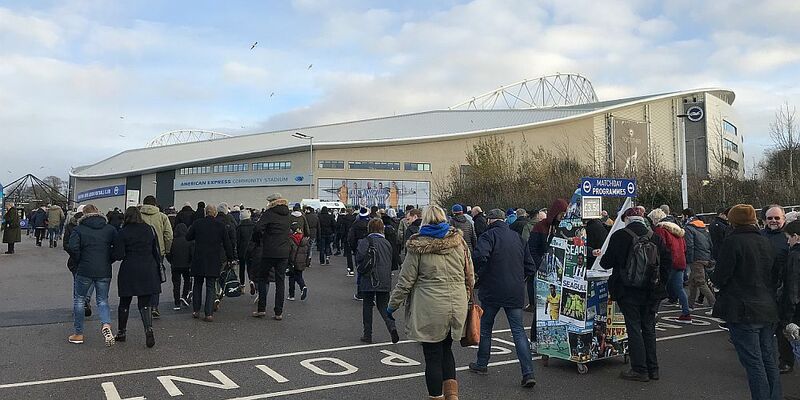 Brighton: Mat Ryan, Bruno Saltor, Lewis Dunk, Shane Duffy, Gaëtan Bong, Anthony Knockaert (José Izquierdo 85), Dale Stephens, Davy Pröpper, Solly March, Pascal Groß (Izzy Brown 73), Glenn Murray (Tomer Hemed 63). Subs not used: Tim Krul, Connor Goldson, Ezequiel Schelotto, Beram Kayal.